Many say that Cygnar’s vanguard is their advanced mechanika; indeed, the nation is unequalled in the synthesis of magic and science. Their advanced technology is evident in the varied strengths of their troops from specialty forces such as the fabled Stormblades and units of gun mages down to trencher and long gunner infantry. The Royal Navy too is peerless in its might because of mechanika support for its ships, and it has become crucial in preventing incursions from the sea in recent times. As new warjacks trundle off assembly lines, mechaniks find themselves forced to implement alterations in the field to suit the conditions of combat. It would seem that war is changing the pace of Cygnar’s technology as swiftly as it is changing the pace of its people. Their foundries produce more weapons, warjacks, alchemical components, and material to support the war effort, and goods and rare materials throughout the kingdom are now rationed for the military. In truth, the Cygnaran spirit resting in the hearts of its soldiers is the military’s true strength. Even after massive losses over the past campaign season, so many of them are still eager to take up arms and fight despite the risks. 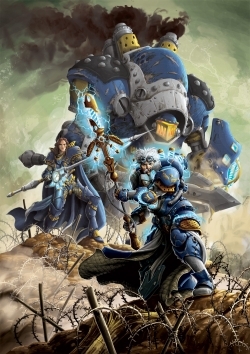 They are more than willing and ready to defend themselves and their beloved kingdom from those who would crush the principles of freedom and all for which Cygnar stands.